Run a rolling pin over the slices of bread to make them thinner. Season the apples with nutmeg and salt, then dress with the lemon juice. Combine with the cheese. In a small bowl, combine the Dijon mustard and the maple syrup. Spread the mixture on each slice of bread. 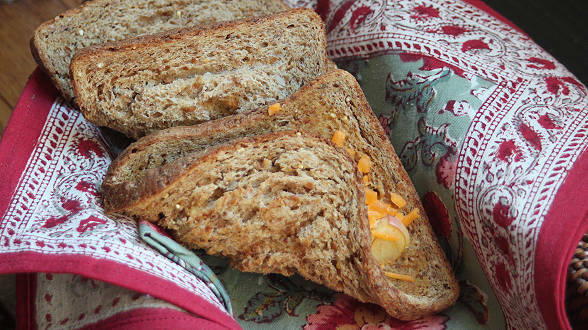 Place some of the apple-cheese mixture over each slice of bread on top of the mustard-syrup. Fold the corners of the bread together to create a triangle. Squeeze the sides together to ensure that they are well-sealed. Arrange the turnovers on a rack set on top of a baking sheet and spray lightly with canola oil. Bake for 10 minutes, or until golden brown. In Recipes-list.com we have selected the most viewed recipes from category - uncategorized . Enjoy the best recipes specially selected for you! Apple-Cheddar Turnovers is the right choice that will satisfy all your claims.